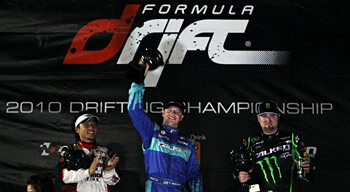 Long Beach, Calif. – August 22, 2010 – Formula DRIFT returned to the Las Vegas Motor Speedway for Round 5: After Dark. Tyler McQuarrie piloting the Falken Tire Nissan 350Z found the top of the podium alongside his Falken Tire teammates for their 2nd ever sweep. The Las Vegas Motor Speedway hosted the event to a sell out crowd under the stars and lights in the Nevada desert. Round 5: After Dark featured the Vegas Pro Am finals, Fatlace One of One Showcase car show, Monster truck demonstration, Drag Races, and was highlighted with the Formula DRIFT championship competition. The competition heats up with only two events remaining in the 2010 Championship season. The action filled weekend came down to a battle of the V8’s. Making the Top 4 for his first time, Tony Brakohiapa in the Cooper Tire / BSP Tuskegee Airmen Mustang went against point leader, Vaughn Gittin Jr. in the Monster Energy / Falken Tire Ford Mustang for third place. Gittin gained the victory and maintains the championship points lead. The final battle pitted Falken teammates Daijiro Yoshihara in the Discount Tire / Falken Tire Nissan S13 against Tyler McQuarrie in the Falken Tire Nissan 350Z. Mechanical problems forced Yoshihara to forfeit from the competition giving McQuarrie his first ever victory and moves him up the rankings into 9th place overall. 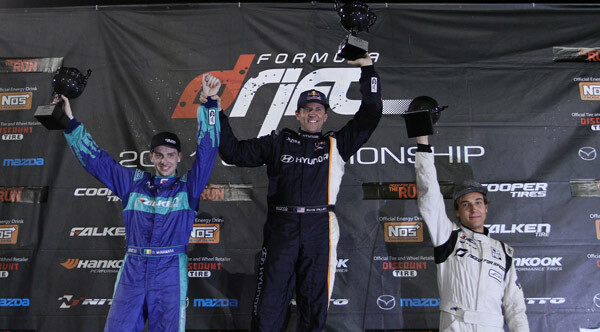 McQuarrie will carry the momentum of the victory to the next stop of the Formula DRIFT championship at his hometown track for Round 6: Point of Impact on September 10-11. This is the last event before the Finals in October and the drivers will be sure to put it all on the line for a chance at the title. Tickets are available on-line.